The hurricane is an extremely sweet alcoholic drink made from lime juice, passion fruit syrup and rum. 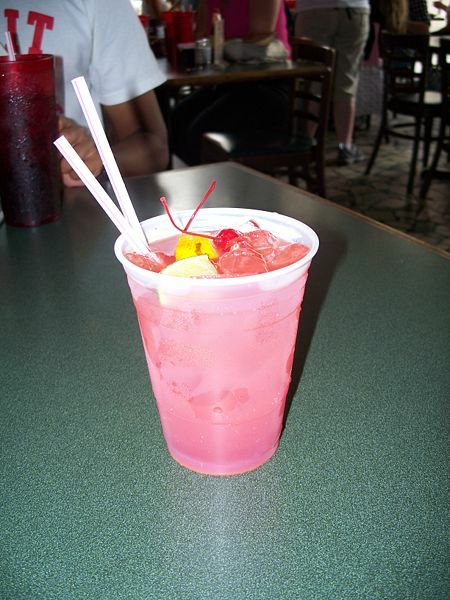 It is one of many popular drinks served in New Orleans. The creation of this passion fruit-colored relative of a Daiquiri drink is credited to New Orleans tavern owner Pat O'Brien. In the 1940s, he needed to create a new drink to help him get rid of all of the less popular rum that local distributors forced him to buy before he could get a few cases of more popular liquors such as scotch and whiskey. He poured the concoction into hurricane-lamp-shaped glasses and gave it away to sailors. The drink caught on, and it has been a mainstay in the French Quarter ever since. It is more commonly served in a disposable plastic cup, as New Orleans laws permit drinking in public and leaving a bar with a drink, but prohibit public drinking from glass or metal containers.